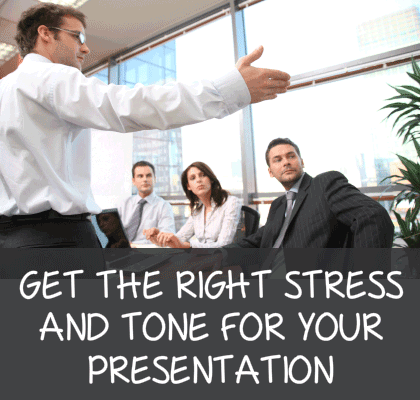 So why do you want to get the right stress and tone for effective presentations? It’s because when you stress the right words in your presentation it helps you get your points across with impact. It’s that simple. Because the stress and tone that you give to certain words serve as audible clues for your audience; like signposts pointing to your meaning. Because that really is effective presenting. So when you want to help your audience, you can do so by with these oral presentation skills tips. Practise. Aim to practise your presentation well before the real thing. Therefore, aim to read your script out aloud. Note the meaning of each passage and test where the stress on your words works best. Just like these trainee doctors as they practise their presentation skills. Mark-ups. Mark your script, cue cards or notes with a highlighter or sharpie. These highlights should help you place the emphasis where it’s needed best. Edit. Remember to edit your script as you practise. Remove those tricky words and the long sentences. Then, substitute with shorter, simpler words and sentences. And, lastly, put the stress into those words that help build meaning. Repetition. You can always combine stress and repetition. Repeating a key word or phrase is enhanced when you lay on the extra tone. Pause. Presenting at too fast a pace prevents you from placing the right stress where you need it; too fast a pace and all your words carry pretty well the same tone. So, slow down and pause. Suddenly your pausing helps you to place some exaggeration on key words. Stress, tone and emphasis help your audience to actively listen to your main points. That’s because your audience gauges the relevance of those points by the stress that you apply. As audible sign posts they can’t be overlooked. For more skills tips, you can always attend a public presentation training course. And as we train at more than 40 training centres in the UK you are never that far away. So, please don’t hesitate to get in touch.